A complicated assemblage of glass beakers and steel tubes emits scents into this outpost of skincare brand Aesop, designed by Paris studio Ciguë above a record store in Nottingham, UK (+ slideshow). 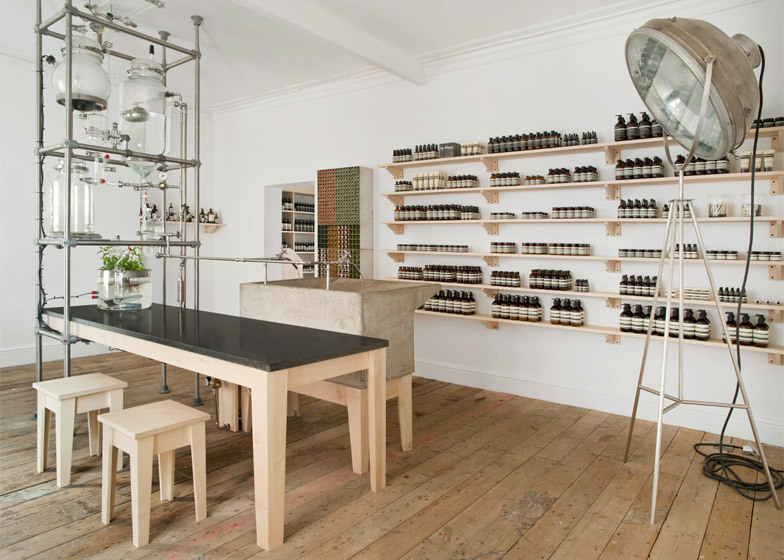 Ciguë worked with Aesop's in-house design team to create the interior of the 33-square-metre space, on the first floor of music retailer and label Rough Trade's branch on Broad Street. 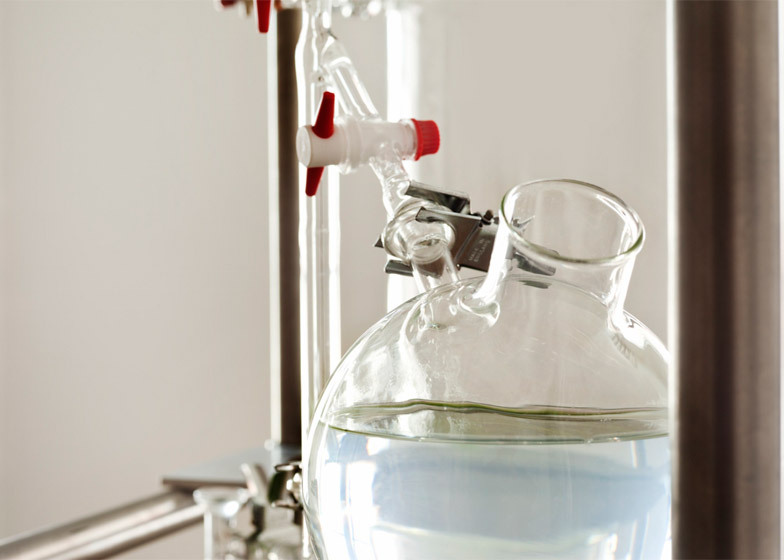 The three-tiered contraption includes a glass kettle, live plants and feeding taps – connected by a series of pipes – and is situated in the centre of the room. A similar device was created by a Design Academy Eindhoven last year to waft historical smells into its setting. Installed within a steel frame that spans floor to ceiling, the equipment is designed to disperse the scents of Aesop's essential oils through the store to entice shoppers to venture upstairs. "It might also be seen to reference Nottingham's long-term embrace of industrial and artistic enterprise," said a statement from Aesop, which has also recently opened stores in Seoul and Hamburg. 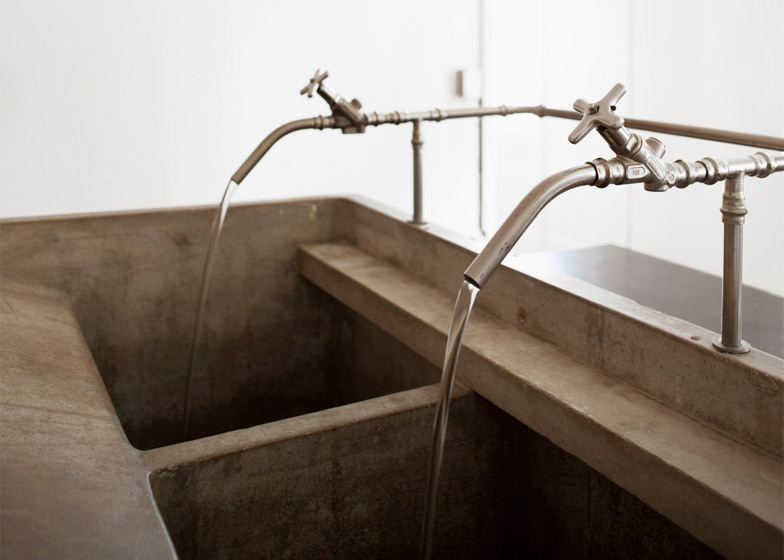 The frame also supports one end of a table topped with Belgian black stone, while the pipes stretch across to taps over a large concrete sink. Light-coloured sycamore wood is used to form the base of the table, the sink and a set of stools for customers to sit at during consultations. 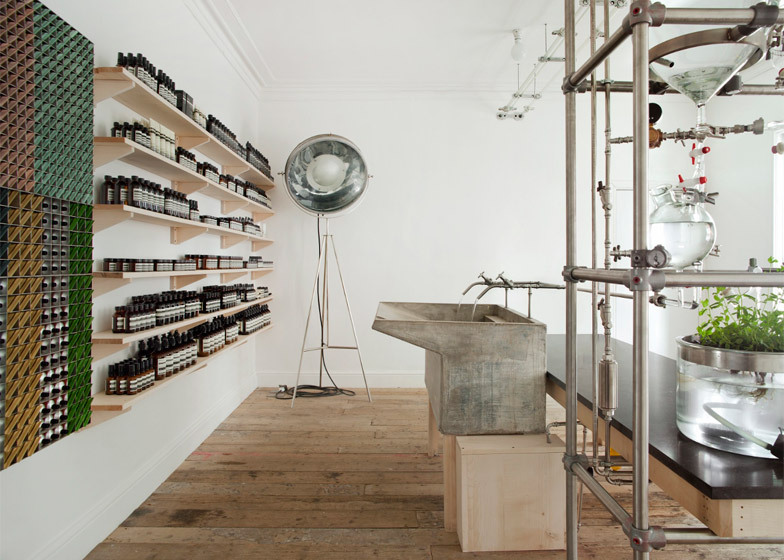 The same material forms shelves along the wall opposite two large windows, displaying Aesop's signature brown bottles that contain skin and haircare products. "Sycamore is used for point-of-sale, shelving, and simple seating that issues an implicit invitation to linger," said Aesop. The white-painted walls and ceiling are paired with pinewood floorboards to keep the space as light as possible. Aesop was founded in 1987 by Dennis Paphitis, who told Dezeen that his aim is for no two of the brand's stores to be alike. Designers including Snøhetta, JamesPlumb and Torafu Architects have all contributed to Aesop's fast-growing portfolio of over 100 shops – see 10 of the best in our roundup. 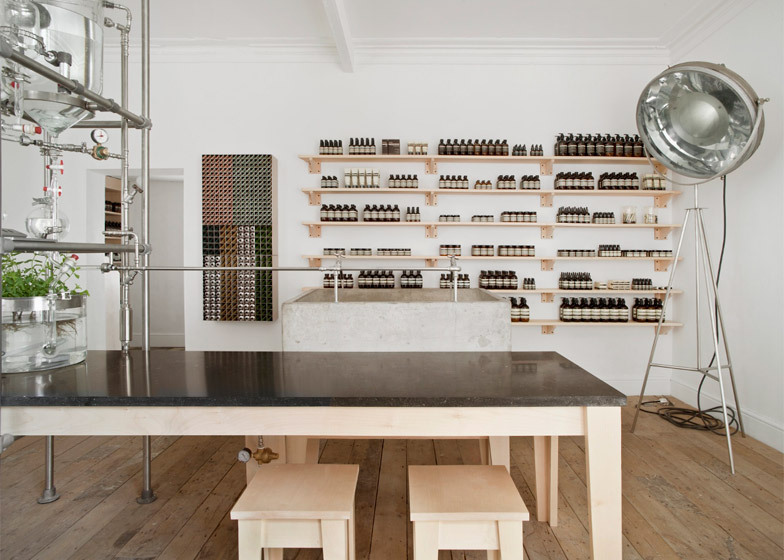 Ciguë has previously designed interiors for Aesop stores in London's Covent Garden and Islington, as well as Le Marais and Tiquetonne in Paris.